A special Choral Evensong was held on Sunday 26th March to mark the retirement of Freda Chapman as Choir Mistress of St Michael’s Church after more than 30 years. The Church was full of well-wishers and past and present choir members and Freda was very pleased that most of her family were able to be there especially as it was also Mothering Sunday. Over the years, Freda has encouraged many young choristers to fulfil their singing talents. 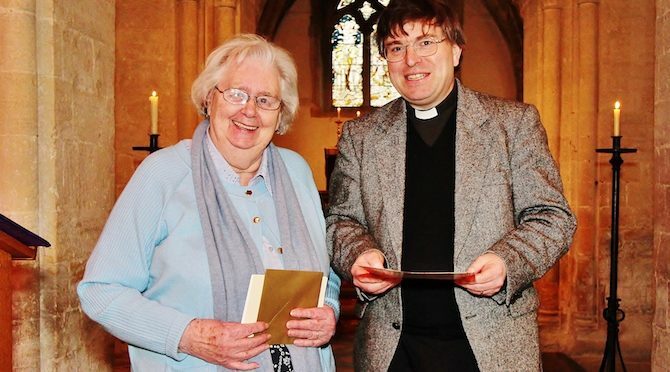 A collection had been made from the congregation and the choir and the photo shows Father Jason presenting Freda with a certificate from the Royal College of Church Music in appreciation of her years of service, a large bouquet of flowers and a cheque. Freda had chosen her favourite hymns and it was a lovely service and an appropriate tribute to her long service. Freda is also, of course, our ‘poet in residence’ at the Blewbury Bulletin.